As part of a new HKRB mini-series, we are profiling 3 independent radical publishing houses in a string of major literary cities. To compile the series, we find just 3 of the best independent presses in each city whose catalogues we really think are worth exploring. Then we ask an editor from each publishing house to tell us a bit about their project and what they print. This month, we are looking at London’s independent literary scene. Next up will be New York and Hong Kong! Comment or get in touch here or on Facebook with any publishing houses you think we should consider. Judging from your catalogue, Pushkin Press is particularly keen to promote world literature. Could you say something about what books you look out for and why? What gap does Pushkin Press fit in within the London literary scene? Yes, our focus is very much on books from all over the world, the vast majority of which are translated from other languages. We have published books from more than 15 different languages, in fact. We look for original voices and good storytelling and our books are mix of old and new – modern classics, rediscoveries and contemporary literature as well. As for the gap we will, I don’t believe any London publisher has the same single-minded focus on international literature, including children’s books. Can you tell us a bit about the Pushkin Collection? The books that you publish in this range can be by authors as huge as Charles Dickens, but these are the that other more mainstream publishers don’t print, is that right? What are your aims here? The Pushkin Collection is mainly a collection of early and mid-twentieth century modern classics from Central Europe as well as Japan. However, we’ve also found that the format lends itself well to shorter works which don’t work in other books in the same way and so we’ve published contemporary books that feel classic in the series as well. As for Charles Dickens – and a few others – these are odd exceptions from an earlier period; we rarely look that far back any longer! Tell us what’s coming up at Pushkin Press – what should we particularly be looking out for in the next year or two? This year we will I in fact publish nearly 70 books across all our imprints. 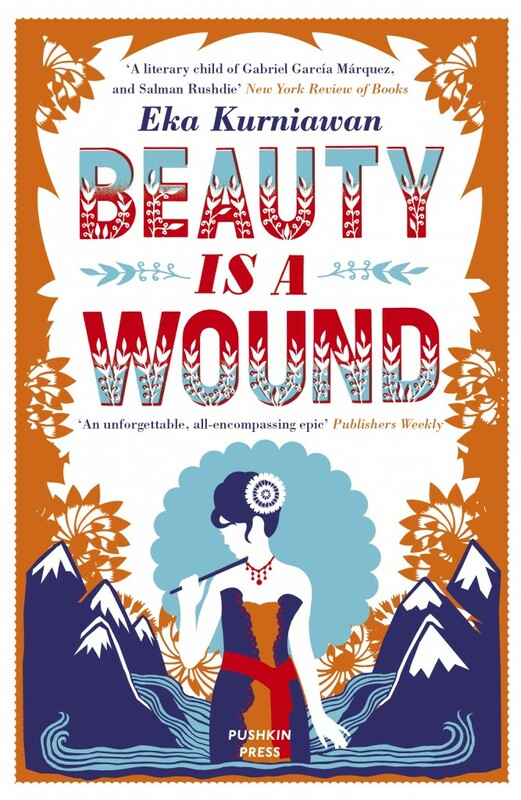 I’m particularly excited that Indonesian and Man Booker International Longlisted Eka Kurniawan joins the list with Beauty is a Wound. Later in the year we publish the incredible War Diaries of Astrid Lindgren. Next year look out for exciting new novels from Denmark, Estonia, Belgium and Germany, not to mention children’s books from Japan, Finland and France. You can browse the Pushkin Press catalogue at their website. Judging from your catalogue, Hurst is pretty varied. Could you say something about what books you look out for and why? Is there anything that connects all Hurst books or something that distinguishes them from others? We have traditionally specialized in books on Africa, Asia and the Middle East, and many of the other areas we publish in – Islamic studies and humanitarianism, for example – have close connections with these regions. But we have catholic tastes, and consider submissions from almost all areas in the humanities and social sciences. Though many of our books are by academics, one quality that most of them have is the potential to resonate beyond the academy. Indeed, our role is often to present the fruits of academic labour in such a way that non-academics can appreciate and benefit from them. Can you tell us a bit about publisher’s work in South Asian Studies? Our readers will be particularly interested in this material. Feel free to suggest a book or two as well! Our South Asian (and, indeed, South East Asian) studies list is now large and diverse. As well as books on India and Pakistan, we’ve recently published several fascinating books about smaller and lesser-studied countries in the region, including the Maldives and Nepal. And, relative to the size of the country, we have a long list of books on Sri Lanka. We’ll be adding to that list by publishing A Long Watch in May this year, the memoir of Commodore Ajith Boyagoda, who was detained for eight years by the Tamil Tigers. It provides the most vivid and nuanced insights into the Sri Lankan civil war that I know of. Tell us what’s coming up at Hurst – what should we particularly be looking out for in the next year or two? It’s exciting times at Hurst. We’ve recently expanded our staff and we’re publishing more books than ever before. In the next couple of years look out for some timely and trenchant interventions into global political issues, from Islamophobia and refugees in Europe to ivory smuggling and Western military interventions in Africa. There will also be an important book on ISIS by Olivier Roy, a book on military strategy by David Kilcullen, and some fascinating and beautifully written cultural histories – of Beirut, of Kabul, and of the coconut. You can browse Hurst Publishers catalogue at their website. A review of Hurst’s new book ‘Shooting Up’ is forthcoming in the HKRB this month. At the HKRB we often see ourselves as something of a ‘radical’ publication. Actually there’s a lot of discussion about radical texts in Hong Kong at the moment because of the booksellers who went missing after selling texts that were seen as threatening to the Chinese government. But ‘radical’ can be a slippery term, and probably one used too casually. Could you say what Influx considers to be a radical book? Radical is certainly an interesting term. Ostensibly it seems to mean something out on the fringes, at the extremes of a subject. In this way we can term communists radical as much as we can fascist groups like ISIS. However, it is all contextual, depending on the default position of the dominant power and culture. In my mind, radicalism on the right wing is Thatcherism – a brutal politics that cares only for self-interest, yet this is the absolute norm. In other people’s minds, in the UK at least, left wing radicalism is the desire for free education at university level, which I consider to be basic. Books that are a threat to the Chinese Government would certainly appear to be radical to those in power and those who are oppressed in China. But in the UK, the Little Red Book is seen as radical. I would also argue that state oppression in China is radical, as it’s at the extreme of government. Someone in China may argue that our democracies are a sham and that we are prey to extreme free marketeers and oppressed by a radical faction of the establishment. Both opinions are correct, and incorrect depending from where you’re viewing the situation. On the other hand, I also recognise that the term ‘radical’, in the UK, has come to mean ‘progressive’ or ‘revolutionary’ but generally in terms of left wing discourse – anarchism, intersectional feminism, fully automated communism, all the isms. Each year there is a ‘Radical Book Fair’ in London. It is highly unlikely that you would find a Milton Friedman text for sale, or Ayn Rand’s Atlas Shrugged – but these are radical books, just on the right wing. We are always happy to attend the London Radical Bookfair, but I’m uncomfortable with the name. These ‘radical texts’ are radical in a political sense – pushing the boundaries of what is permitted to be published, what thoughts we are allowed to think. However, they are not often radical in any literary sense. You are unlikely to find the next William Burroughs or Christine Brooke-Rose on a stall there. I think, in terms of what Influx publish, it is in the intersection between power and thought that our more ‘radical’ texts occur. We don’t have a lot of power in publishing, we don’t have vast reserves of capital to put behind a publicity campaign or hand out to major writers for advances. On the other hand, we only have to please ourselves. We can publish whatever we like because we don’t have a marketing department leaning on us to justify how well it will sell. We are the marketing department. That way we can publish work at the extremes of literature – not necessarily politics – which other publishers can’t. Take our best selling book, Imaginary Cities by Darran Anderson. It’s a 560 page essay on the relationship between real urban landscapes and fictional architecture (ranging from computer games, novels, comics, music etc). It’s a work of genius, written as if it were a vast city itself, with interconnected boroughs, and districts of writing. The subject matter is vast, the references never ending and the writing is highly academic in concept, yet completely accessible to everyone. That, to me, is radical, because no one else has published something like this. We were able to because we lack conventional power, but also because we recognized that Anderson’s thoughts, ideas and ambitions should be in print. We commissioned the book before a word was written because we believed in the project. It’s paid off – proving that radical books can also make money! What was it that made you start or join Influx? What gap does Influx fit in? We started Influx Press, like a lot of other small publishers in the UK, because we wanted to publish the sort of books we wanted to read, but weren’t available. Gary (co-founder and other editor) and I have quite different tastes in literature so when we both like a book, we know it’s something that might not be out there, available to buy! We have been described as ‘radical’, ‘cheeky’, ‘boundary pushing’, ‘a bit of all right’ ‘wannabe urban dissidents’ and having ‘real ale opinions’. So it seems we have a broad appeal. I like to think there is a gap for everyone (so long as they aren’t just a copycat press), so the gap we fit in is an Influx shaped one. The more books out there, the better. It’s a crowded marketplace, sure, but with all the recent technological advances – the ability to sell easily from your own website, social media to use for connecting and sharing with potential readers – it is possible to exist, just about, without mainstream visibility. Having said that, we do also have all the usual stuff – a distributor, a great printing company, connections in the media etc which mean we don’t have to rely on our own communication channels to survive. Most projects like Influx Press will burn bright and then die. We are not here to set up a legacy, a corporation, a big business. We are here to publish fringe literature as long as we possibly can. One day we will be gone, but the future is for other people. We are interested in what is possible right now. Tell us what’s coming up at Influx Press – what should we particularly be looking out for in the next year or two? I’m particularly excited about our next anthology, An Unreliable Guide to London (July 2016) – a book that explores the parts of our city that no one writes about, the places where normal people live normal lives. A kind of radical response to Richard Curtis movies! We have some amazing writers in that collection – M John Harrison, Chloe Aridjis, Will Wiles, Yvvette Edwards, Courttia Newland and many more. Further down the line we have two short story collections that will set our tiny world alight. Eley Williams’s Attrib. and Other Stories looks at language in a completely new way (she studies dictionaries – known as ‘lexicology’), and Clare Sita Fisher’s How the Light Gets In is at the tightest of tight ends of storytelling, like Thomas Bernard’s The Voice Imitator, but British and very funny. We have non-fiction about the Baltic Coast and a controversial train line development in the UK (it is far more interesting than it sounds!). We also recently took in a load of submissions for novels, so I’m hoping we find at least one book from that to publish in 2017. It’s an exciting time to be publishing! You can browse the Influx Press catalogue at their website. Please support the HKRB by following our Facebook page.